Zest is visualization toolkit for Eclipse. The primary goal of Zest is to make graph based programming easy. Using Zest, Graphs are considered SWT Components which have been wrapped using standard JFace viewers. This allows developers to use Zest the same way they use JFace Tables, Trees and Lists. Please visit our main page at http://www.eclipse.org/gef/zest. The following code snippet shows how to get a simple graph up and running using an SWT style interface. In this example, a graph is created with 3 nodes and 3 edges. 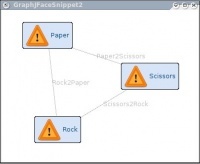 The nodes are labeled rock, paper scissors. To use this example you need to download zest core, zest layouts and draw2D. 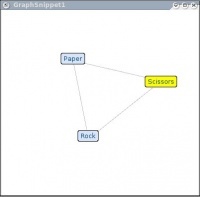 * which is connected to scissors which is connected to rock. Further snippets can be found [here]. * This snippet shows how to use the IGraphContentProvider to create a graph with Zest. * And for each of these, the source and destination are returned in getSource and getDestination. * A label provider is also used to create the text and icons for the graph.